Sonia Friedman’s newest West End offering has been the subject of much excitement, and with heavy-weights David Tennant and Catherine Tate featuring in the line up, you can understand why. The show had almost sold out before it even opened, but despite the fact that Much Ado About Nothing is quite a safe choice of play, with expectations raised to such high levels there is always a risk that the production might be a disappointment. On this occasion however, we were not disappointed. In fact, despite the relatively conservative choice of play, this production has a number of surprises in store. In short, it is fantastic. Walking into the auditorium, you are at first faced with a beautiful stage-wide silvery curtain. Naturally, one expects a classical Shakespearian set, with intricate Elizabethan costumes and make-up. The curtain goes up, and the first surprise comes: the audience is blasted with cheesy 80’s music and a girl in a bikini practicing her dance moves by a sun lounger. It doesn’t take long to realise that Josie Rourke’s new production will be quite unlike any Shakespeare we have seen before. At first, we were skeptical, but as the show went on, it became apparent that despite it’s modern setting, the comedy in Shakespeare’s script has been perfectly preserved; in fact, the setting does much to make it even funnier, with Tennant’s bizarrely epic entrance on a golf buggy being a particular highlight. Incidentally, and unsurprisingly, Tennant is outstanding. His comedic timing is completely impeccable. Very few actors can summon waves of laughter with the flick of an eyebrow and from the front row his wonderful facial expressions were hysterical in places. 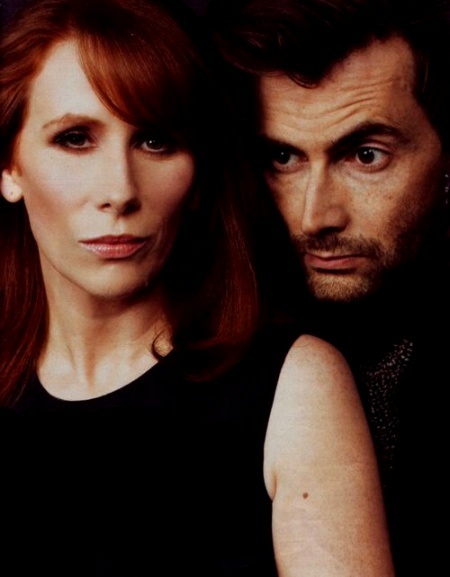 His pairing opposite Catherine Tate was also an excellent decision. Tate showed remarkable emotional depth as a stage actor, and she was even able to use some of her well-known catch-phrase comedy to great effect. The two stars are propped up by a clutch of superb performances, in particular from Adam James as Don Pedro, and from John Ramm as the uproarious Master Constable Dogberry. Finally, a special mention must go to Tom Bateman in his sensational professional debut. The design is understated but extremely effective. The revolve is used to good effect, and moving pillars are used to neatly create new locations. Particularly excellent moments come when Benedick and Beatrice are drawn into their friends’ respective traps, tricked into falling in love with each other. We won’t ruin the surprises, but suffice to say that paint, hoists and a particularly unwanted book are used in a novel way to reinvent these already hilarious scenes. To sum up, this new production of a Shakespearian classic is a roaring success. We have stopped short of giving it five stars only because it hasn’t delivered anything particularly new to the theatre scene. However, as the saying goes, ‘if it ain’t broke don’t fix it’, and this show certainly has nothing that requires fixing! It is a brilliant and delightful evening of heavy-weight theatrical entertainment. Much Ado About Nothing runs at the Wyndham’s Theatre until 3rd September 2011.